CH: When you think about the relationship of the Bible to science and to human origins, what comes to mind? John Walton: My first question is, do I know what the Bible claims? We have to read the Bible well with respect to the Hebrew texts, to genre, and to its ancient Near Eastern context. Jeff Schloss: I didn’t grow up with the Bible. When I became a Christian, I asked first: what is the nature of humankind? What does science tell us about it? How does that square with Christian beliefs about human nature and our shared need for redemption? More recently, I’ve been thinking about arguments for design, the nature of divine action and providence, and the nature of conscience. John: I think the early chapters of Genesis address such questions. The image of God is the key unifying factor as we take account of the Bible’s claims regarding the nature of humanity. Most people in Christian history have been trying to read Genesis in the context of relevance to their day. I want to talk about what is demanded by the biblical text. Lots of times the conversation between Bible and science is driven by people who think the Bible makes certain demands. Jeff: If the Bible invites me to believe something, I’d best believe it. If it requires me to do something, I’d better do it. For those of us who view the Scriptures as reliable and trustworthy, if we find what looks like an error in a message that we also take to be central, then we have to wonder whether either the message isn’t an error or it isn’t a central message. Input from textual scholars is crucial, but science may also contribute. It is an ancient and legitimate interpretive principle that we take God as author of Scripture and of nature, seeking an understanding of each in light of the capacity for reason he has given us. John: With the biblical text, having reached that point, you still have the question whether it is the intention of the author to say the earth is 10,000 years old, and whether that is secondary or central? For a long time people thought the Bible claimed the earth was flat or was the center of the universe. When science suggested that was not the case, the text was re-evaluated. People then say science is determining what the Bible says. I don’t look at it that way. I think science, just like ancient Near Eastern documents, prompts us to new research, but in the end, it’s got to be the Bible that makes the call. 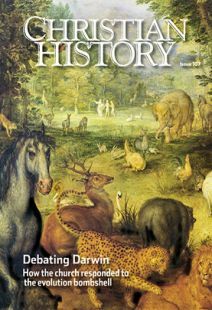 CH: Do modern scientists still talk about Darwin? John Walton is professor of Old Testament at Wheaton College and the author of The Lost World of Genesis One. Jeff Schloss is distinguished professor of biology at Westmont College and senior scholar at the BioLogos Foundation.